This PDF 1.6 document has been generated by Appligent AppendPDFPro 4.3 / SPDF, and has been sent on pdf-archive.com on 14/08/2011 at 19:08, from IP address 218.223.x.x. The current document download page has been viewed 788 times. File size: 1.1 MB (210 pages). 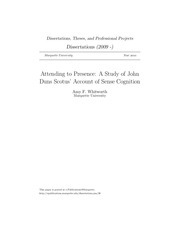 This paper is posted at e-Publications@Marquette. Amy F. Whitworth, B.A., M.A. elements of Scotus’ cognitive theory in order to understand the nature of the phantasm. involves the reception of the sensible form without the matter. that the world is sacralized and thus, is a worthy object of cognitive attention in itself. ground the mediation between sensation and intellection. their support and kindness to me along the way. that Scotus rejects the illumination of Augustine while embracing other aspects of Augustine’s theory. These latter aspects will be discussed in Chapter 4 of this dissertation. questions of how we know and what we know. 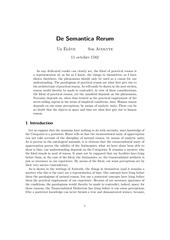 Foundations of Semantics, 1250-1345 (Leiden: E, J. Brill, 1988), 56. Tachau 1988, 56; see also Robert Pasnau, “Cognition,” in The Cambridge Companion to Duns Scotus, ed. 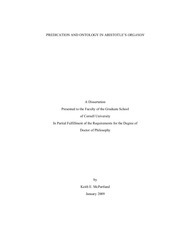 Thomas Williams (Cambridge: Cambridge University Press, 2003), 285-286.
unresolved issues in Aristotle’s account of cognition. and under the material condition of singularity. 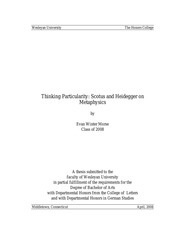 the problem of how the intellect relates to the body-soul composite. body. Whereas the sense has an external object, the intellect requires an internal object. is the nature of the phantasm that allows it to be present to the agent intellect? intellection? In this dissertation I will address these questions in the following way. sensation as the reception of sensible form without matter. therefore worthy of cognitive attention in themselves. between sensation and intellection can be assured. sensible species as an intentio, and thus, the nature of the phantasm. case in my own study, but was further intrigued with the Quodlibetal Questions as a text. chapter with a brief critical summary. De Anima, trans. J.A. Smith in The Revised Oxford Translation of The Complete Works of Aristotle, ed. Jonathon Barnes (Princeton, NJ: Princeton University Press, 1984). resolutions of difficulties that lie outside the scope of this work. scholarly debate, for my purposes here, I will set aside these debates. discussion of the Categories, see pp. 146-195 in the same text. D.C.: Catholic University of America Press, 1981), 1. Aristotle on Nature and Incomplete Substance (Cambridge: Cambridge University Press, 1996), 10-11.
dependent on the individual concrete being. here as the individual concrete being. Metaphysics that such an analysis is offered. Owens, ed. John R. Catan (Albany: State University of New York Press, 1981), 36.
advantage of grounding the categories in the world. hold both of these accounts is problematic, but Barnes offers a resolution. of a universal formula that they are cognized. substance is a this so-and-so which is also separable,” 91.
individual and as that which indicates what the individual is, the form or essence. understood as the substratum, it is necessary to determine the nature of the substratum. become helpful when discussing the question of the substantiality of the soul in the section on De Anima. Barnes 1995, 95; Sheldon M. Cohen 1996, 164.
a specific something else because it is composed of matter determined in a certain way. to be a saw. Steel is able to be an axe because it has the capacity to have a sharp edge. Metaphysics, 8.3, 1043b18-19. See also Metaphysics 7.11, 1037a1-2. Nussbaum and Amelie Rorty (Oxford: Clarendon Press, 1992), 71.
capable of being, but this essential capacity comes not from matter, but from form. Aristotle’s to ti ên einai, which literally means “the what it was to be” for a thing. Sheldon M. Cohen 1996, 15; Metaphysics 7.4, 1030b4-5. Sheldon M. Cohen 1996, 164. See also, Barnes 1995, 94-95. Owens, ed. John R. Catan, 1981), 48-58, 52.
much time to understanding the characteristics of a body that can be ensouled. is the principle of animal life, Aristotle concerns himself with the difficulties of his task. S. Marc Cohen 1992, 58. Anima, ed. Martha Nussbaum and Amelie Rorty (Oxford: Clarendon Press, 1992), 8.
since matter in itself is unknowable, what is known is simply the form or essence. the reason that the soul is joined to the body or the bodily requirements for such a union. between an art and its tools. the study of the soul. substantia; et est substantia secundum quod est compositum.” See also Sheldon M. Cohen 1996, 158. Above, Aristotle defined life in terms of activity: nutrition, growth, and decay. existing matter is already formed matter. So the body is itself a composite. capable of living what has lost the soul it had, but only what still retains it. . .” See also, Cohen 1996, 158. 119-33. See also S. Marc Cohen 1992, 68.
to specify the material conditions, the formal conditions, and the teleological conditions. Amelie Rorty (Oxford: Clarendon Press, 1992), 75-91. S. Marc Cohen 1992, 68.
living being. This means being able to account for both life and the exercise of that life. by the body that is already living. Sheldon M. Cohen 1996, 164. Sheldon M. Cohen 1996, 165. See Sheldon M. Cohen 1996, 118, 169. Aristotle’s De Anima, ed. Martha Nussbaum and Amelie Rorty (Oxford: Clarendon Press, 1992), 27-56. Anima, ed. Martha Nussbaum and Amelie Rorty (Oxford: Clarendon Press, 1992), 133.
upon the sense so that the sense actually becomes what it only potentially was. Aristotle gives a detailed account of what happens in the process of each sense. senses is that which in its nature is able to sense. that which that which has the capability of sensing actually now senses. 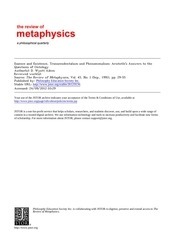 multiplication of species theory see, for example, Tachau 1988, especially Chapters 1-3.
how Aristotle characterizes the reception of form by the sense organ. likeness of the sensible object that now exists in the soul at the level of the body. understanding of this passage and then briefly discuss some of the current debate. type of efficient causality observable in the universe does not the matter of the agent remain in the agent? It is not received by the patient,” 84.
of form, how is this meaning of matter relevant? known are identified.150 Owens appeals to Metaphysics, 1041b7-28 to make his case. magnitude. See De Anima 418a7-19 for Aristotle’s discussion. Owens 1981, 92. I will take the point up again in chapter 4 when I am discussing Scotus’ own account. more or less extreme readings of Aristotle. Scotus’ account of cognition, self-awareness does play a greater role than found in Aristotle. Ancient and Medieval Theories of Intentionality, ed. Dominik Perler (Boston: Brill, 2001), 49-61. See p.
means that a patch of color comes to exist in the eye, and this is a physiological change. appears on the wall. Though there is a red patch of light on the wall, still the wall is itself not colored red. This file has been shared by a user of PDF Archive. Document ID: 00032895.